I usually have more progress photos than this. However this time I just sat down and painted so I only have the set up picture and the final. This was a great practice piece. I used a spot light this time because the light outside was so weak. I think it helped make the painting more dramatic. Three things that often lead to bad paintings, and all of them have to do with weakness. 1. weak center of attention - no story is being told in the painting. 3. weak paint application- lack of boldness or confidence by the artist. Remember, the meek shall inherit the earth. The weak get zip. Beautiful Painting Peter. What an artist you are! This is one of the best I've seen of yours so far. Very nice...and it seems like you've figured out why. gotta be bold! Thanks for sharing. Your new gallery in Lincoln is very fortunate, wonderful work: fine sensitivity and strong design. Love it. Wow Peter, this one is beautiful. 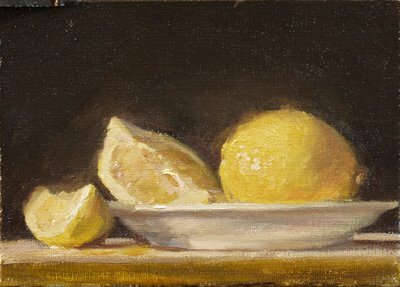 I like how the light reflects off the lemon into the background. The light is great and the composition as well. Can't wait to see more of your work.